Formula E this year. With her helmet donning a wide, toothy grin, Noodle swerves and corners the electric race car over a few good laps before stepping out of the cockpit and giving some handy tips to the engineers. Jaguar picked her for their campaign to inspire youngsters to develop a passion for innovation and engineering. The I-Type 1, in its dramatic fluorescent blue and black livery, marks the marquea��s return to racing after a 12-year hiatus.The electric race car has been developed by Jaguar Racing with electronics and auto technology developed in collaboration with title sponsors, Panasonic. Team drivers will include GP2, IndyCar and WEC racer Adam Carroll, GP3 champion Mitch Evans and Ho-Pin Tung who also comes with prior Formula E experience. a global platform to inspire and attract young children to a career in innovation. 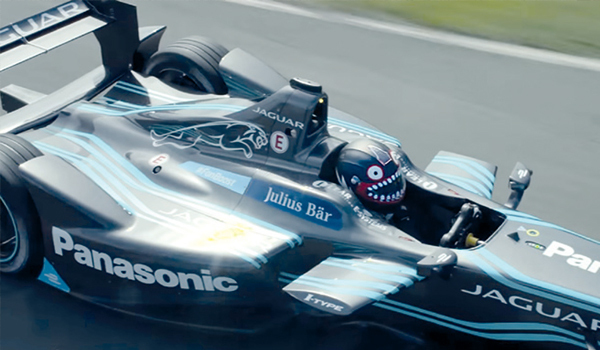 With the Jaguar Racing and Noodle partnership, we hope to inspire millions of young people to help invent thefuture,a�? says Fiona Pargeter, global PR communications director, Jaguar Land Rover. It also released a statement from Noodle saying, a�?The young minds of today are the engineers of tomorrow. We are in the driving seat and our imaginations are the fuel. Ita��s time to lead the charge and build a better world.a�?